This 5.0L EFI Fuel Injection Wiring Harness is far and away the best quality and easiest installation fuel injection wiring harness for your Early Bronco or Classic Ford Truck. 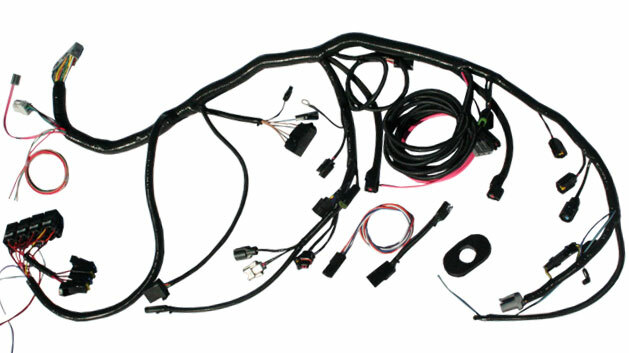 Designed to work with 89-93 Ford Mustang 5.0L or 5.8L EFI motors with Mass Air-Flow, simply lay this kit over the engine and connect the wires. Will also work with 86-89 speed density Mustang engines. To run this EFI Wiring Harness on a 1986-89 Speed Density 5.0L engine, you will need to ensure the MAP sensor is hooked up to vacuum and ignore the MAF sensor (it can be used for a future upgrade). This engine wiring harness is designed for engines that have the throttle body coming out on the passenger side of the upper plenum. Single connection into the main wiring harness and it is done.